Is The Google Penguin Algorithm Applicable To Search Engine Rankings ? Have you ever wondered why Google would choose to call one of its ranking algorithms Penguin? ... I have! ... and after a little brainstorming session came up with some simple links to the bird itself and how the algorithm looks for relevant links to your website. 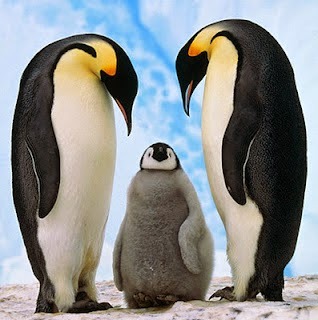 Penguins are, as I mentioned above, 'birds of a feather' and tend to huddle together in groups as a rookery on land. Penguins also spend a lot of their time at sea 'fishing' and only return to land once they have had their fill to regurgitate their latest catch to feed their progeny. Now, we can substitute some of these words to better describe the relevancy of the Google penguin algorithm and how it pertains to the search engine rankings. Firstly lets substitute the word 'birds' with the word 'links', so now, Google's Penguin joins together 'links of a feather' or 'links of similar type' to help its search engine deliver relevant search results to its users. The word 'relevant' according to my source is derived form the latin relevāre, which means to lighten or raise up ... can you begin to see how relevant links to your web pages can raise up your websites to a better ranking within the search results? Following the latest Google Penguin Update this relevancy seems to be ever more important and strategies that include showering your website with links from irrelevant sources of content, simply is not going to impact your search rankings (positions) in the slightest. Penguins hang out with Penguins and in sufficient numbers they offer protection, warmth and nurturing among it's fellow birds. Throw in a plethora of other birds into the mix and those penguins cease to be a rookery, they become just a mish-mash of generalised birds that fail to interact with one another to offer any of the previously mentioned benefits. Therefore, it is always better to obtain links from similar niched domains as you own, as this has that one important factor that serves a healthy dish of relevance to your own websites. Now, this is simpler to say than to actually do. In many instances those websites within the same industry or niche simply DO NOT wish to join your group of emperor penguins, choosing instead to be rockhoppers and wander off into the distance never to be seen again. So, you may ask, how do we gather links from similar domains to our own ... in answer to this, I suggest you contact me further and I can guide you more effectively on how to achieve this all important element. The practice of obtaining links from relevant content has been going on for years and things haven't really changed up to this day. A relevant article or post is easy to produce with relevance to your website or niche. However producing sufficient content to obtain relevancy is a different ball game all together. There are other algorithms within Google that will simply ignore duplicate content, refusing to index said content and therefore effectively negating all your hard work in producing that killer content. So, on many occasions marketers turn to spinning software to produce the quantity of material .. my views on this is simple .. DO NOT use automated software to perform further iterations of your content, it simply reads as garbage and again has a detrimental effect on your penguin busting strategy. If your going to spin anything take the time to do so manually, the results are exponentially improved. Obtaining links through contextual text has long been the norm, these are otherwise known as anchor text links. Inserted naturally within relevant content from a relevant article on a relevant domain, is where the real power of grouping together like penguins for protection, warmth & nurturing takes effect. There has been copious amounts of information published regarding these types of links and I am not going to add to that already published material. Suffice to say, there is much more I could add to this outburst of creativity, however I wish to finish with the following words. If you wish to be loved by a penguin, then think like a penguin, speak like a penguin, walk like a penguin, look like a penguin and all the worry of being expelled from the rookery diminishes to nothing.